Jungle Cloth Diaper Cake Discounts Apply ! 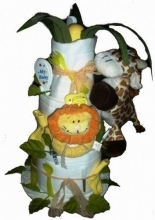 The In the Jungle cloth diaper cake is adorable, cute, fun and filled with useful baby products. Perfect as a gift, delightful as a baby shower centerpiece, this diaper cake will be a sure hit! Cloth diapers are delicate for baby's skin (and have so many uses that mom's who are planning on using disposable diapers will greatly appreciate this diaper cake, too!). *Every cake is individually made, and each have their own character. Cake ingredients may vary from cake to cake due to color theme, availability of baby items and hand-crafted creativity. You may request specific items where options are noted with an "*" (i.e., a blanket or hooded towel), but inclusion of requested items cannot be guaranteed. Rest assured, all cakes are exceptionally adorable. *This item will ship separately from other items in your order via standard USPS shipping, Please allow an additional 2-10 days for shipping. Please contact us for additional shipping methods.